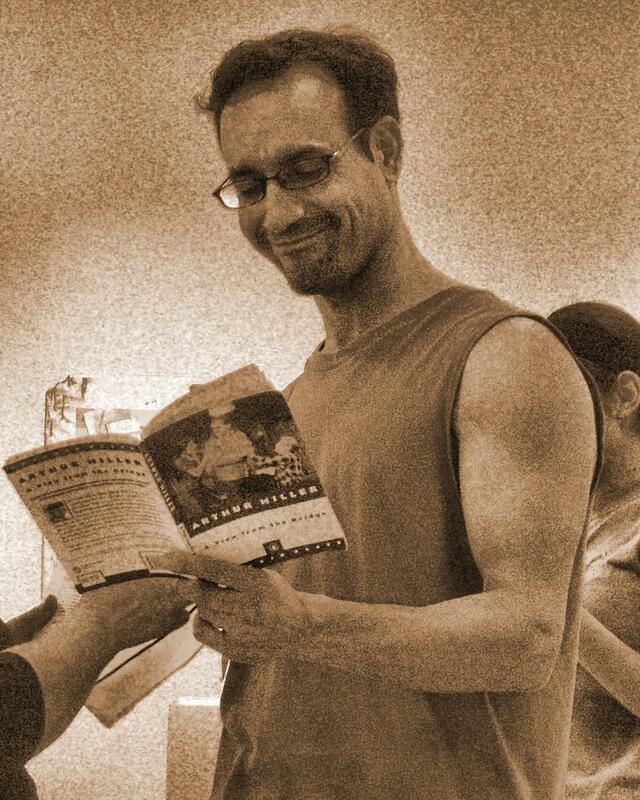 Actor Eddie Zertuche, who plays Eddie Carbone, reads the script. Photo courtesy Adam Adolfo. Arthur Miller has been Hispanicized. Artes de la Rosa, a performing arts organization in Fort Worth, Texas that promotes Latino culture, has reworked Miller’s A View from the Bridge by making the characters Puerto Rican and Dominican. They were Italian in the original 1955 play. Artes de la Rosa has previously produced works from playwrights Federico Garcia Lorca, Nilo Cruz and Luis Alfaro. In December, it will present 26 Miles by Quiara Alegría Hudes, the Tony Award-winning playwright of 2008’s In the Heights. A View from the Bridge is part of its five-year American Classics Initiative, artistic director Adam Adolfo said. The theater has already produced Cat On a Hot Tin Roof by Tennessee Williams and will tackle Eugene O’Neill later. Adolfo changed little in the play’s dialogue, which centers on Eddie Carbone, who helped raise – and has an intense attraction to – his niece, Catherine. But Catherine has fallen in love with a man who has arrived from the Dominican Republic illegally. Adolfo hopes more Hispanics will get interested in going to the theater. For more information: If you’re in the Dallas-Fort Worth area, you can still catch A View From the Bridge until Sept. 11. The plan will run Fridays, Saturdays and Sundays at the Rose Marine Theater, 1440 North Main Street, in Fort Worth. Tickets cost $12-18 and can be purchased here. The website Theater Jones also has a terrific article about the play.